About a month and a half from the start of the season, the men’s and women’s cross country teams are well into their training for the upcoming season. Both squads are preparing to build off last year and rise up the rankings in the difficult Atlantic Coast Conference. Each fell toward the middle of last year’s standings, with the men finishing ninth at the ACC Championships while the women placed seventh. Of the two teams, the men’s squad looks to have the better chance at cracking the top five in the conference, as they return nearly every runner from a year ago. The key loss from the 2016 team was redshirt senior Michael Runco, who led the team all of last year on his way to placing 31st at the NCAA Mid-Atlantic Regional with a time of 31:27.9. But while his absence will be tough to handle, it’s about the only hole the Panthers will have this year. The team’s only other senior last year was Sewickley, Pennsylvania, native Alex Archer, who finished 118th at the ACC Championships and didn’t compete at the Mid-Atlantic Regionals. Stepping into the leading role will be a trio of well-proven athletes in seniors Aaron Lauer and Ryan Hughes and sophomore Nick Wolk. Lauer was right on the heels of Runco at times last season, finishing just seven seconds behind at the ACC Championships, and Hughes wasn’t too far back as the No. 4 runner. Wolk — consistently the third-fastest Panther on last year’s team — had an outstanding first year campaign, becoming the first-ever Panther to earn ACC Freshman of the Week Honors after his performance at the Tommy Evans Invitational, where he finished 4th in the 6.4k run. Rounding out the top five will probably be junior Matt McGoey and either senior Billy Caldwell or junior Sebastian Curtin. Caldwell and Curtin went back and forth last season, and each should take a step forward this year to help the team further. After moving up four spots in the ACC last season, the Panthers should be able to take another step forward this fall. If head coach Alonzo Webb and men’s assistant Bryan Jackson can keep their athletes motivated, the team can continue to improve and challenge the ACC’s best. The women’s team has also been improving over the last couple years, as its seventh place finish at the 2016 ACC Championships was two places higher than in 2015. Having lost seven seniors, it might seem like the women’s team would have a harder time backing up its 2016 season, but the experience the Panthers return with this fall could actually lead to better results in November. Of the seven graduated seniors, only one, Dee Dee Adams, was a consistent contributor. Last year, she finished 67th at the Mid-Atlantic Regional and 6th among Pitt’s runners with a time of 22:07. All five Panthers who finished ahead of Adams will be returning this season, including junior Gillian Schriever and senior Melanie Vlasic. Schriever earned All-ACC honors in her sophomore year after finishing fifth at the ACC Championships. 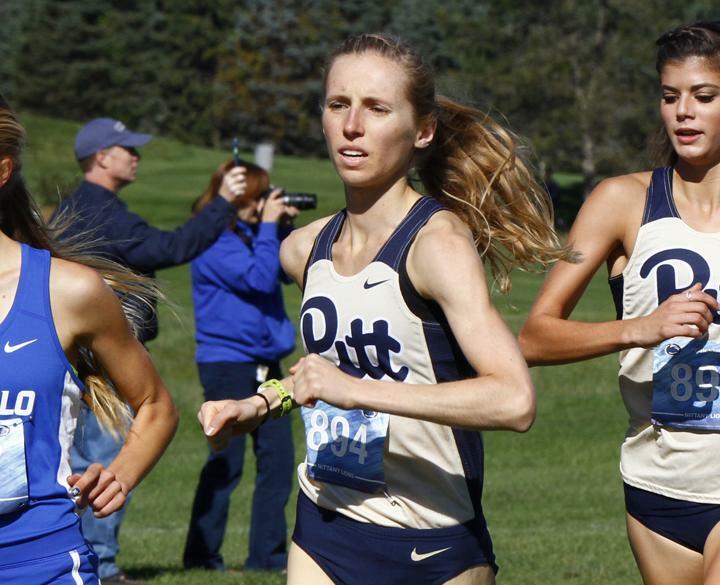 At the end of the season, she became the first Panther since 2004 to qualify for the NCAA Cross Country National Championship, finishing 106th with a time of 20:52.1 — the second-best finish in Pitt history. This season, the coaching staff will be hoping for her to continue her rise through the ranks and notch All-American status. Vlasic — who finished 24th at the Mid-Atlantic Regional — could also be a big factor for the team. A couple of seniors — Kelly Hayes and Ariel Pastore-Sebring — should retain their spots in the top five with senior Ellen Crook also looking to contribute. Overall, while the women lost more athletes than the men, they’re in just as good of shape heading into the fall. The core of the team is intact, and with Schriever leading the way, the Panthers should have a chance to beat any team they face. The season begins Saturday, Sept. 2, with the Duquesne Duals in Schenley Park. Other major races include the Joe Piane Invitational in South Bend, Indiana, and the Pre-National Invitational in Louisville, Kentucky, before the team moves on to the ACC Championships on Oct. 27.